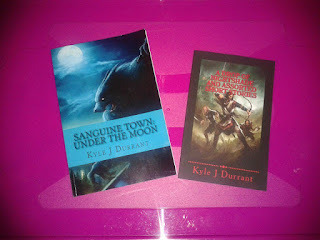 Today I welcome Kyle Durrant to the blog. Kyle is a fantasy author who... hey, you know what, he's going to tell it better than me. Let's dive straight into the questions! Hi Kyle, so you're the author of the Arazian Archives – in which you have your in-progress work Doomprince, and the short story collection A Drop Of Nightshade, plus the Sanguine Town setting, where the supernatural rubs shoulders with the everyday. But I believe that's just dipping our toe into the works you have under way – so tell us a little about the Arazian Archives for starters, where does the inspiration come from? It’s difficult to narrow down the sources of the inspiration, especially now that I’ve been working on the world for five years, but I’d say it all comes down to J.R.R Tolkien. Probably sounds a bit cliché, but it’s the truth. I read The Hobbit in primary school and enjoyed it so much that I ended up writing what was essentially a piece of plagiarism. I was young and just wanted to write something similar. It was when I started reading Raymond E. Feist’s work, after reading countless other fantasy series, that I came up with my idea for the Arazian Archives, and since discovering George R.R Martin I feel like my imagination has exploded. I can't blame you for that - I fell in love with Tolkein's work at probably about the same age! Tell us a little about the setting for the Arazian Archives – and what makes it stand out to you as a setting that you love to explore? The Arazian Archives are based in the world of Araz, which is split into four main continents: Norlim, Sarrodan, Erendar and Weritan. These continents originally had very simple names, and Norlim was formerly called Araz, and the world was Araz-NorSar. It was actually only recently that I worked it all out completely, renaming the continents and the world and essentially discovering the history of the world. And that’s probably why I love exploring it. In a way, I don’t see it as a world I created but a world I have accessed; a world I am exploring and chronicling, and I want to see my stories as a record of its history. Every chapter or story I write opens up new possibilities, tells me more about this world, and I want to share that. I love the amount of work that you've clearly put into establishing your world – visitors to your website can see the gods and demons of the world, the races, even a hefty map of the world that looks like it's taken an age to complete by itself! By putting in such groundwork for your creation, does that help you feel more sure-footed when it comes to telling the tales within that world? Or do you find it is the telling of the tales that unfolds what you want to feature in your mythology? There used to be a lot more on the website, but it just told people far too much. What’s the point of reading the stories if all the information is there for the taking? But things like gods, demons, races and the world’s geography are things that I feel are helpful to see, and provide just enough to make you want more…hopefully. It’s definitely a bit of both. As I mentioned, I feel like I’m discovering and exploring a world rather than creating it, and although I come up with things myself, such as the Drakon’Zoku, I feel like it is the world that forms them. Originally they were just dragon-men that smashed things and held a grudge, but they’ve evolved into an honour-bound, Oriental-esque race that I doubt I could have come up with without the stories informing me. Who are your inspirations as authors? I can see hints of the likes of Fritz Leiber in the work you've done already, am I wrong? I am ashamed to admit that the name Fritz Leiber is alien to me, though hopefully not for much longer. My main sources of inspiration are J.R.R Tolkien, Raymond E. Feist and George R.R Martin, but there are plenty of others that have inspired me. The names that spring to mind are Mark Lawrence, Anthony Ryan, David Gemmel, Janny Wurts and Robin Hobb, though I’m certain there are more. Oh no! I'm wrong! Still, you must dive into the Lankhmar stories - great reads! Doomprince is in progress – what's your hoped-for schedule for that? And your plans for when it is completed? Doomprince has been in progress for about as long as Araz has existed: five years. I finished a first draft in 2012, I think, but it was full of forced-in exposition, illogical jumps and the worst pacing I’ve ever witnessed. So I restarted it, using that first draft as a springboard, and have been writing it ever since. So in terms of schedule, I really don’t have one. I sit down to write what I can every day, and if I can’t write Doomprince I write something else, such as Sanguine Town or Hero Legends. Turning now to the Sanguine Town setting, tell us a little about where that idea came from. The idea for Sanguine Town came to me whilst watching a series on Netflix called “Hemlock Grove”. I loved the first season, and it inspired me enough to start a series involving supernatural creatures. It was slow at first, but with TV series like True Blood I soon formed a pretty solid idea of what I was going for. 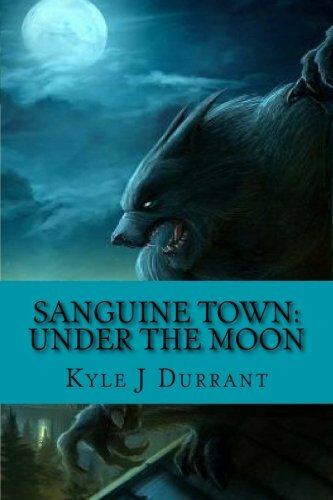 I can't help but think that Sanguine Town has the feel of a pretty cool TV series about it, with hunters, vampires and werewolves fighting it out in a near-future world – complete with a global British Empire. How do you see that project developing? If it ever ended up being a TV series I would be happy, and I would be lying if I said I hadn’t thought of writing some scripts, but right now I’m content to keep it in the books. I’ve completed, and published, Under the Moon, but the main story I’m going for is simply titled “Sanguine Town” and, not to give too much away, it is focused around a small group of characters, each from a different “breed” (vampire, werewolf, hunter, human) who get drawn into a conspiracy. It’s on a bit of a hiatus, but the idea is still there. Suppose you had to cast the lead characters from both Doomprince and Sanguine Town – which actors would you choose for the lead roles? This is a tough question, as I’ve never really given it much thought. I try to make my characters as unique as possible without drawing on public figures. For Drop of Nightshade I’m going to draw an actor from Game of Thrones and say that Alfie Allen would possibly fit the character fairly well, though I’ve literally pulled that from the top of my head. For the role of Andrew in Under the Moon…it has to be someone young, and unfortunately I can’t think of any young actors. But I could see Jared Leto pulling off most of the characters I create, simply because he’s a very talented man, haha. I notice your books are available as paperbacks but not ebooks – is that a deliberate choice to steer away from electronic formats? They are available as ebooks, but I prioritised the physical version. I find it almost impossible to read ebooks, and I struggle when reading through my own work (can’t afford to print it) as it’s on a computer screen. I feel like there’s a little more intimacy in a paperback, as though I can feel the energy of the writer in its pages. But that’s just a matter of personal preference, and that’s why I made them available as ebooks as well, so people could have that choice. What has been your most satisfying moment in your career so far as a writer, that moment that has made you punch the air and say yes? To be honest, I don’t feel like I’ve had many satisfying moments. I’ve maybe ten copies in total from both books, so at times I feel like the effort I put into them has been for nothing. If I had to mark the most satisfying moment, though, it was when my Sixth Form college got me into the local newspaper, announcing that I had published my book. Although it was largely about the college promoting itself, it made me feel like I was being noticed, and for it was after that newspaper was released that I got most of my sales. Well, I darn well hope this rustles up some more interest for you! Links at the bottom, folks! And lastly, our traditional double question to close out our interviews – what are you reading right now, and what has been the best book you've read in the past year? I’m a slow reader, unfortunately, and as much as I love reading I’m easily distracted. I’m currently reading Andrew Miller’s “PURE”, which I absolutely love. As for the best book I’ve read in the past year, I would have to say Raymond E. Feist’s “Magician”. I’ve read it so many times – that last read was probably the seventh, at least – and when I need inspiration I go back to it. Can't argue with the latter, it's a really good read. Andrew Miller is a new name to me, so will investigate! Thank you very much, Kyle! You can follow Kyle on Facebook at facebook.com/dp.kylejdurrant and on Twitter at https://twitter.com/KyleJDurrant. Check out his website - with links to buy his books and, did I mention a smashing map of his world, over at http://kylejdurrant.weebly.com.